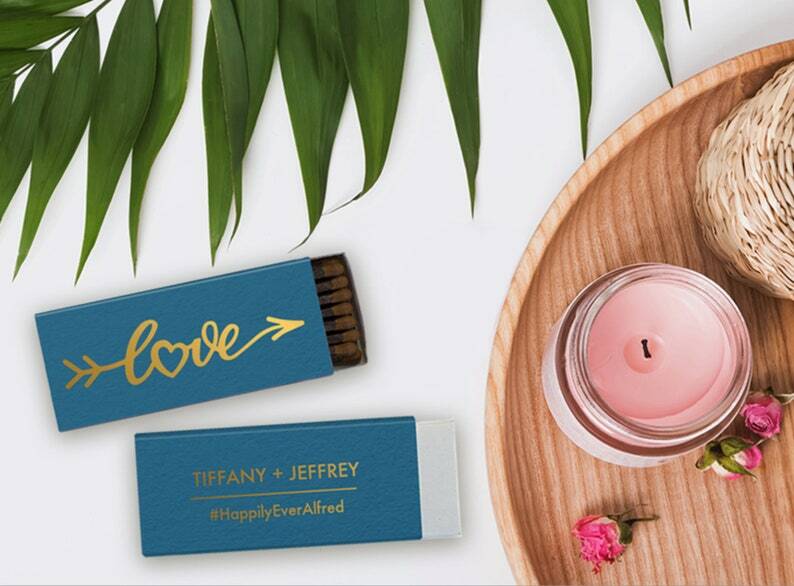 Customized LOVE matchboxes are perfect party favors for a wedding, birthday, anniversary, dinner party or any occasion! Print on the front AND the back for the same price! These match boxes are bigger than average (great for cigars) and measure approximately 3.3" x 1.5." Approximately 19 or 20 wooden matches are included in each box. Listing is shown in our Chroma Peacock matchbox and Satin Gold foil stamp. 61 colors of matchboxes available! Please see photo #2 for all available colors. We offer 3 types of foil: Shiny, Satin and Matte. Please see photo #3 for all available foil colors! Match books are personalized to your liking. Please see photo #4 for fonts and photo #5 for clip art options! PLEASE NOTE: Orders must be placed at least 21 BUSINESS DAYS before your expected delivery date. Rush delivery is available for an extra fee and the order must be placed atleast 8 BUSINESS DAYS prior to your expected delivery date. Don't see a clip art design you like or have something else in mind? 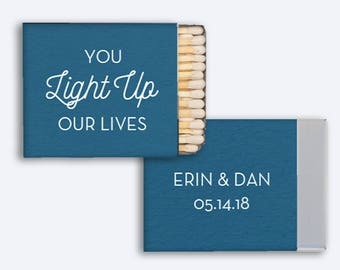 We can custom design the match boxes to fit your vision and theme. Please message us for a quote! 1. PROOF REVIEW - After we receive your deposit and details, proofs will be carefully designed and emailed to you within 36 hours. Three complimentary rounds of revisions are included with each order. Match books are not made until we receive final approval from you. Please note that GubbaGumma is not responsible for errors on printed paper products that were approved during the proofing process. However, we are happy to reprint your paper product in the case of an error found upon delivery. 2. PRODUCTION - After receiving final approval and payment, we will begin production on your special order! Once proofs are approved, production usually takes 7-10 business days. Shipping then takes an extra 1-5 days depending on distance and shipping method. Expedited processing & shipping is available for an extra fee. 3. SHIPPING - All orders ship via USPS with a tracking number. Shipping takes anywhere from 1-4 days domestically. Match books cannot be shipped internationally. Expedited shipping is available for a fee. Please convo me for more details. ***INTERNATIONAL ORDERS: Please note for any orders other than cocktail napkins and matches we will need to calculate shipping based on package size and destination. If you place an international order for any of these items we will contact you immediately with a shipping estimate. 50 Foil-Pressed Custom "A Perfect Match" Matchboxes - 30 Strikes - Real Foil Stamping! Wedding, Party, Birthday, Anniversary, Holiday!